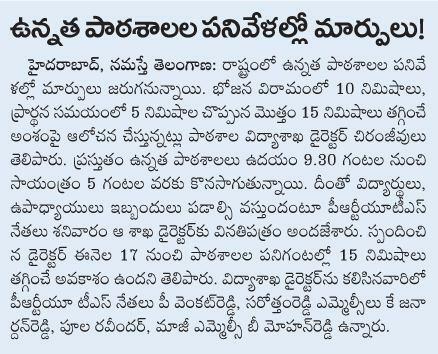 High School closing time reduced upto 15 minutes from 17th Aug 2015 onwards. School timings the school timings for both Primary and Upper Primary/ High Schools is given here under. 09.00 AM to 04.00 PM with lunch break from 12.10 PM to 01.10 PM with eight (8) periods. The first period will be 45 minutes and the rest of the periods are 40 minutes duration. 09.00 AM to 04.30 PM with lunch break from 12.30 PM to 01.20 PM with eight (8) periods. All the periods are 45 minutes duration expect last period which is for co-curricular activities for a time period of 70 minutes that is 35+35 minutes for co-curricular activities/ subject transaction. 09.30 AM to 05.00 PM with lunch break from 01.00 PM to 02.00 PM with eight (8) periods. The periods i.e. 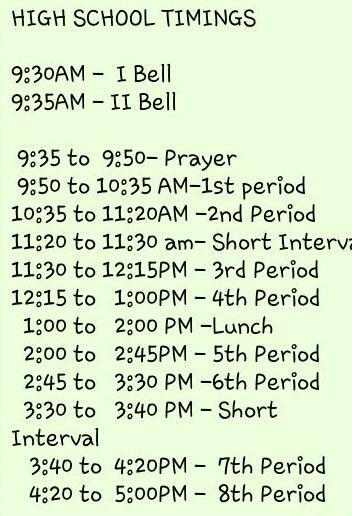 the first 6 periods will be for 45 and the last 2 periods will be of 40 minutes each duration.